With Single Sign-On (SSO) you make all the decisions regarding access and authentication, and you do it in a place already familiar to you. SKYSITE connects to your SAML2.0 compliant Identity Provider, meaning you only have to manage one database for all your applications. When an employee is added or removed, their access to SKYSITE can be automatically enabled or limited. Simple, Secure and Consistent. It’s nice how it’s app-based and cloud-based, so it won’t bog down, either. Using SKYSITE saves so much time and money. SKYSITE makes our subcontractors even faster by being able to send updates and answers to their bidding questions immediately. It’s the best product I have ever seen for our collaboration and coordination requirements. Using SKYSITE is like having another project manager on the team. 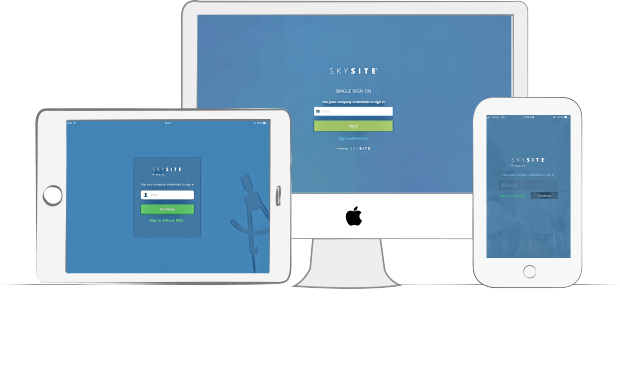 Take control your online security with SKYSITE today.